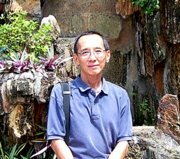 The Khon mask maker of Bang Plad, not only makes beautiful Khon masks and ornaments, he conducts a centre for teaching the making of Khon masks so that the art can be preserved for future generations. 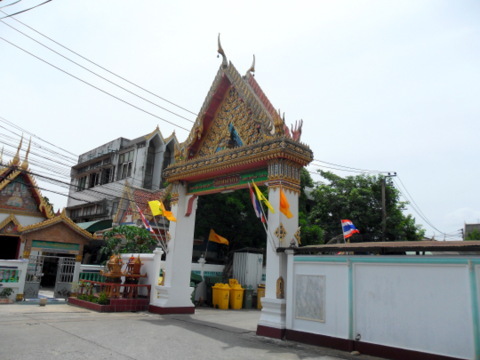 The Wat Thephakorn Occupation Training Centre is located in the grounds of Wat Thephakorn in Charan Sanitwong Soi 68. 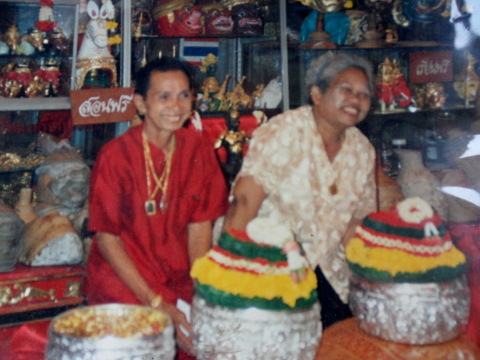 It's also home for the Wat Thephakorn community as the people in the neighbourhood are called. 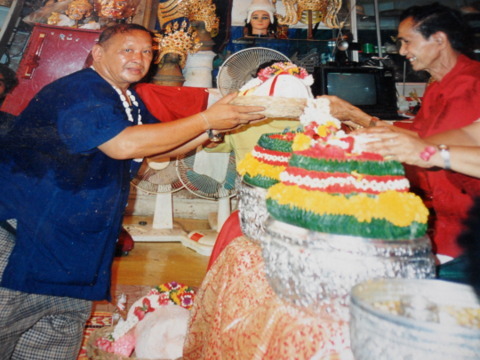 It's a friendly and closely knit community and I had no difficulty finding the place. I arrived at a wooden hut selling food and was a little confused. There was a lady preparing food at the front of the shop. 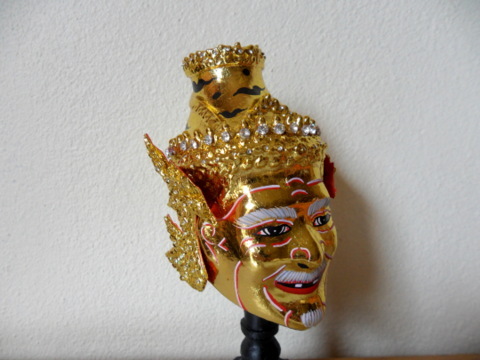 I asked for Khun Sathaporn, the Khon mask maker. 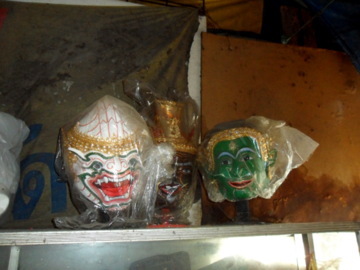 The lady replied that he was away in another province giving Khon mask making lessons. 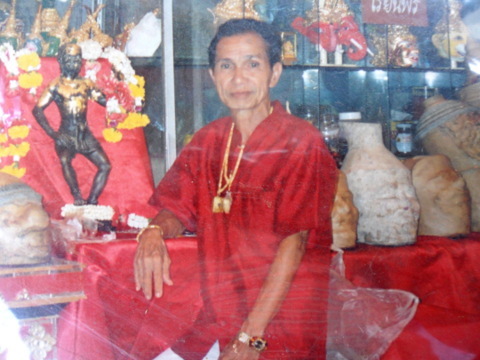 She identified herself as his daughter Khun Patchani. After I explained the purpose of my visit, she arranged two small tables for me at the front of the shop and brought out a cloth bag containing all her father's old photographs, documents and old newspaper cuttings. I was overwhelmed by her hospitality and helpfulness. 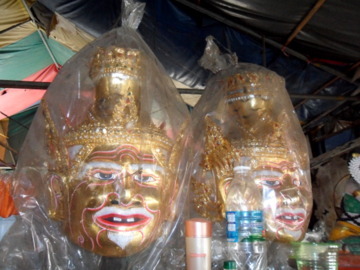 Inside the shop there were dozens of Khon masks in plastic wrappers. Unfortunately Bang Plad was one of the districts that was badly flooded in late 2011. The shop which also serves as the Khon mask training centre was under a metre of water! Many of the photograph frames were damaged. But the photos were salvaged. 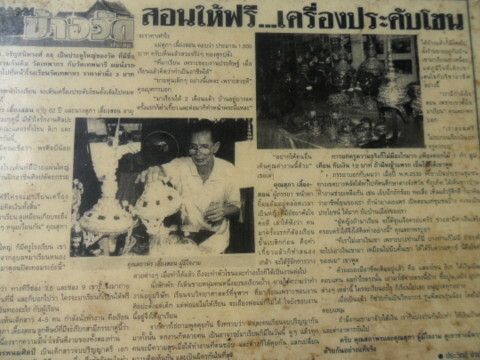 I sifted through the old photos and newspaper cuttings mounted on boards and tried to trace the career of Khun Sathaporn Liangsorn, the Khon mask maker. 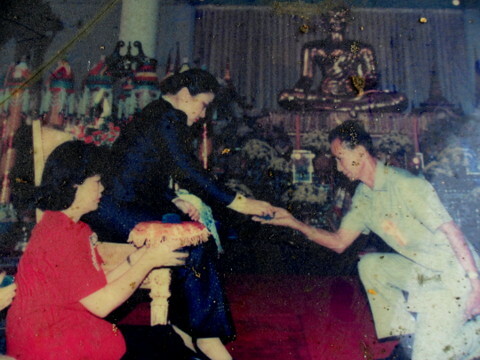 In 1997, a Thai daily interviewed Khun Sathaporn and his wife Khun Supha. Back then they had already trained about 200 students nation-wide. The interview headlined "Free lessons"
In the words of the journalist who conducted the interview, "They love the art more than they love life". 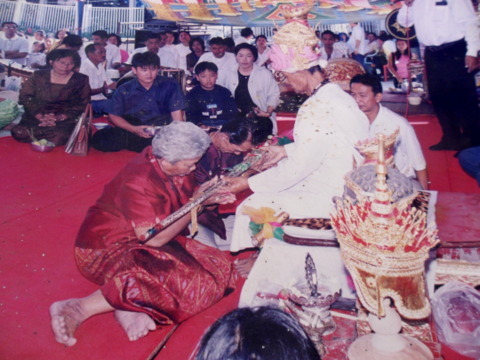 Khun Sathaporn who is 75 this year (2012) started life as a dancer in Khon and Likay (a form of Thai classical dance). 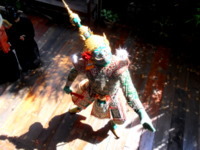 Later he switched to making Khon masks and ornaments like belts, bracelets etc for Khon dancers. 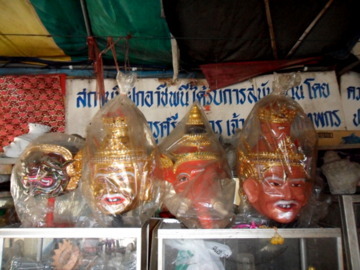 Khun Sathporn's Khon masks range from miniature masks to life-sized masks. He also makes concrete masks as decorative pieces. During his long career he has received several awards and has been recognized as an authority in his craft. Several more accolades followed. 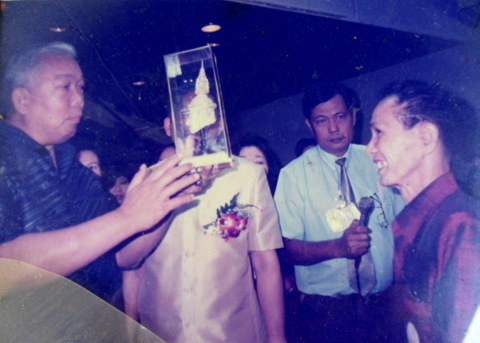 These photos were unlabelled and I am unable to identify the event and date. 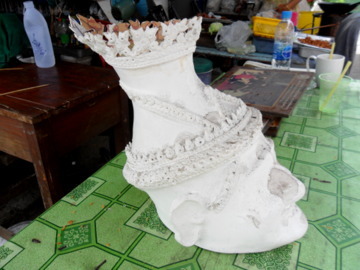 Khun Patchani kindly explained to me the stages in making a Khon mask. First, the frame is made from cardboard; various sizes are made to form the neck and head which are then joined. 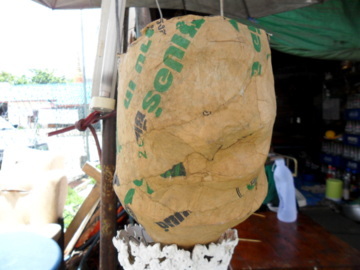 Contours and features are created by pasting paper mache. The cardboard frame is left to dry in the sun. Next, plaster is molded on the cardboard frame and carefully shaped into the features and left to dry. Ornaments are separately made and glued to the mask. The mask then painted and gold leaf is applied to the surfaces to give the glitter. The completed mask would look like this. If it's tough making a life-sized mask, making a miniature would be even tougher. This miniature mask of Hanuman the monkey god is 5 cm from top to bottom and 5 cm from ear to ear (2 inches x 2 inches). 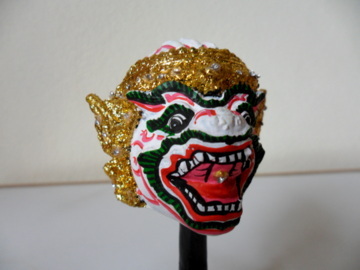 Khun Sathaporn also conducts Khon mask making classes as part of his efforts to pass the skills to the younger generation and preserve the art. During my visit he was out in another province conducting classes. His daughter Khun Patchani has taken after her father. 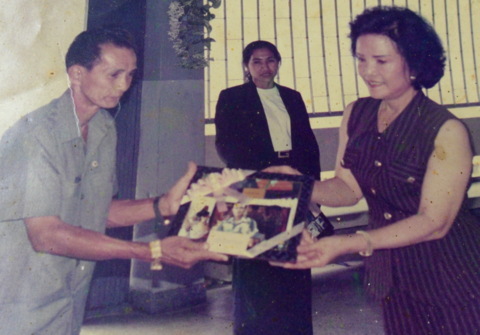 She was born and grew up in Bang Plad in a house behind the shop. 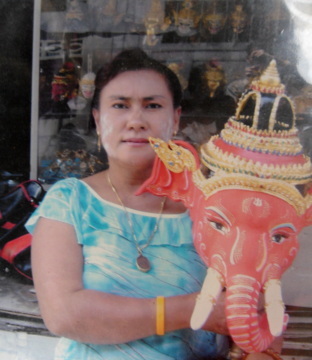 After a stage as a Khon and Likay dancer, she acquired the skills in Khon mask making and conducts lessons in front of the shop. When she is not conducting classes, she makes deep-fried chicken, fish balls and sausages for sale to the children from the Wat Thephakorn School nearby. Just imagine the hundreds of students who have taken their lessons over the years on make-shift tables in front of this humble shop. The lessons are free. Students pay for the costs of the material used in the lessons. The Khon mask maker and his family have dedicated themselves to the art and have strived to pass their skills to subsequent generations. They deserve all the support from art lovers and those who believe in preserving the cultural heritage of their society. Men and women are frequently valued for their financial worth; few are valued for their non-monetary contributions to their communities and society, a contribution that may be of far greater worth. "They love the art more than they love life". I would like to thank Khun Patchani Liangsorn for her kind hospitality and helpfulness during my visit. She made available all the photographs, documents and newspaper cuttings, arranged two small tables for me to work from complete with a cold drink. I never expected such treatment and I am truly touched and grateful for the warm and friendly atmosphere. All photographs taken at the shop are with the kind permission of Khun Patchani Liangsorn. Take the air-conditioned bus service no. 18 from the Victory Monument which goes to Charan Sanitwong Road. 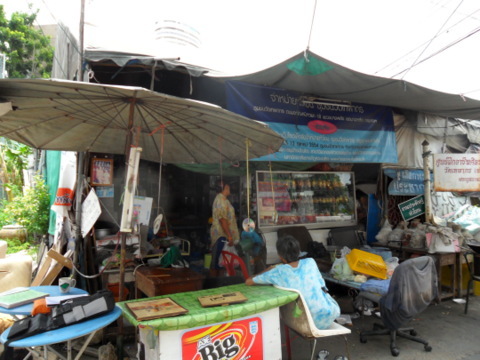 Get off when you see Charan Sanitwong Soi 68. 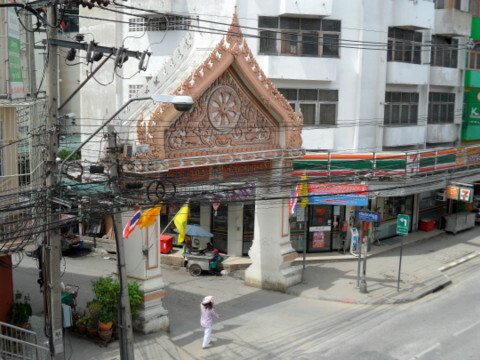 There is a temple arch at the junction of the soi. There is another arch at the entrance to Wat Thephakorn.